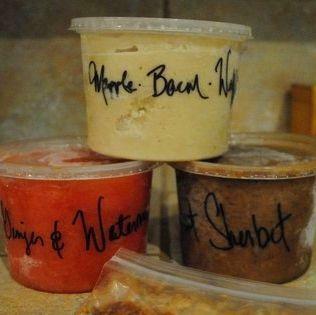 Buoyed by a June "ice cream crank-off" triumph, a local lady's now whipping up by-the-pint artisanal frozen custard & sherbet she'll deliver right to your door. The mad, seasonally dictated flavors run from maple-bacon-waffle, to cherries-port, to sweet pumpkin, all created under the motto "Live Fast Eat Custard Die Pretty". Obviously, "Fast" was a typo.